I graduated in January 2018 and was fortunate to be selected as the Valedictorian. For those of you who do not know, a Valedictorian is typically someone who has the highest academic achievements of the class, which I had 😉 I was responsible to address my fellow graduates during the convocation ceremony which was held on March 24, 2018. Hello Beautiful People! We Made It! We are the graduating class of Fall 2017! To begin with, I’d like to thank God and my family for enabling me to stand in front of you today to share what’s in my heart. 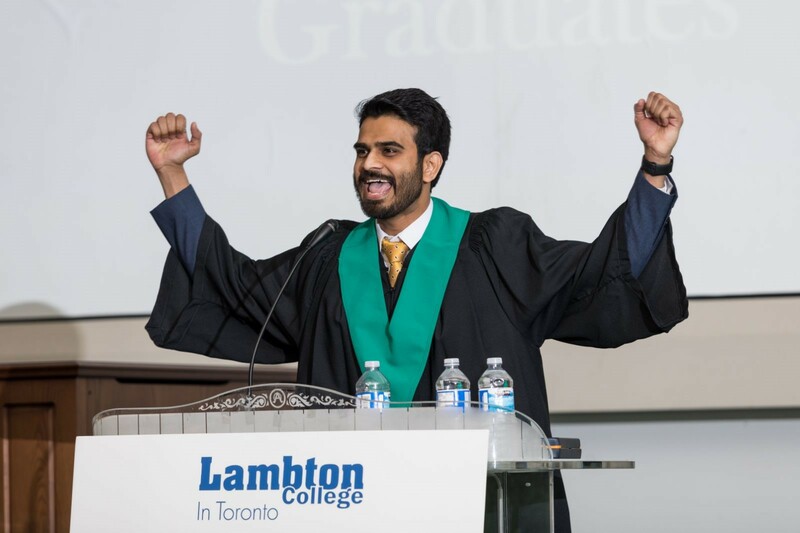 It seems like only yesterday that we first stepped foot in Lambton College In Toronto, which we now recognize as LCIT. It was so much easier to find our classes back then compared to now, wouldn’t you agree? Although, what amazes me is that as we have grown together, the college has also grown. It is as if each of us have personally invested in the college’s growth, and I think we should be proud of that. We may not have had the pleasure of a huge campus with grassy lands and ponds with ducks swimming in them… and that is OK. We sometimes seem to get hung up on things that do not really matter. Try to put yourself in the shoes of those people who did not get the opportunity to come here because their visas were rejected, or they could not secure an education loan. I am sure we all know at least one such person, so instead of focusing on what we did not have, let us be forever grateful for this opportunity that LCIT has given us. For many of us, going back to school after working for several years was a tough decision to make, and thinking about studying in a new country – although exciting – was overwhelming. It was for me! While going through the motions, it occurred to me that I had the power to change my story; and so, just like you, I chose to begin this journey of possibilities with LCIT in 2016. Upon arriving in Toronto, I made sure that I did everything I could to immerse myself in this new experience as an “international student.” I am sure you will agree, being an international student is not easy and comes with its own unique set of challenges. We may have struggled to maintain a balance between studies and part-time work, some of us may have put in a lot of late nights to complete our assignments or prepare for a test because we had to work late. Early morning classes, or early morning shifts – both meant we had to get up earlier to get there on time, especially if you lived in Brampton, Mississauga or Etobicoke. People sometimes ask me how I stay fit. Well, this is because I hate alarms. I snooze, and I snooze and I snooze and I end up getting late… because of which I have to run to catch a bus or a train, and that is how I stay fit!! So many memories we can carry with us. And then, how can we ever forget the drama around group selection at the beginning of each term and all of us struggling to get a morning batch? Or canvassing the whole class and finding out the most studious bunch and trying to form a group with them for assignments to ensure we got good grades *wink*? Wait a minute, am I giving away all our secrets??…haha!! For some of us, this was the first time we moved out of our parent’s home and started living on our own; moved from a cozy bed to a couch, or a spring cot. Nevertheless, I commend all of you for being resilient and perseverant, which has now paid-off as you are celebrating this day with the rest of us. My personal experience at the college has been remarkable. I found all the support that I needed not only to excel in my studies but also to help improve the student life of others through various initiatives. I would like to thank our project management program coordinator, Sandee Vincent, for believing in me and giving me the right amount of push to make these initiatives happen. I’d also like to thank our college Director, Michael Vourakes, who, to this day encourages and supports these initiatives and makes college resources available to us. One such initiative is the Project Management Guild, for short, PM Guild, through which we are able to focus on a project management student’s experiential learning by bringing in several guest speakers to talk to our students and share their knowledge and experience. Together the PM Guild recruited more volunteers to ensure this initiative does not disappear after we graduate. It is not easy trying to lead and motivate a team of volunteers, people who are not paid for what they are doing. However, I have learned that there is power in empowerment. The more you empower someone to do something, the more invested they will be to your cause. I found out later that this type of leadership is called Servant Leadership and its essence is to share power and put the needs of others first. While we were busy running events and study groups for the PM Guild, Sandee proposed that we start a Toastmasters Club in our college. I still remember her one-liner email to me – “Toastmasters – Your New Project”. For several months, we sidelined the idea and only dreamt of starting this club. A famous Japanese artist once wrote, “A dream you dream alone is only a dream. A dream you dream together is a reality”. Then came along Stephanie Cochrane who, most of you know, is a student services advisor here at LCIT. When I presented the idea of starting a Toastmasters Club on campus, she jumped on board right away. When I look back now, she has proved to be the wind in our sails to help make the dream of starting this Club a reality. Also, we couldn’t have done this without a rock-solid executive team, Ved Prakash, Divej Vakharia, Prashant Nalli, Christina Matthew and Rahul Kalparuksha (oh, by the way, this is the same Rahul that I mentioned in the beginning),. They all proved to be the pillars the club needed, and are still holding it together. One of our favorite lines is “We all grow together” and we indeed have over the last seven months since the club chartered. Ved, Rahul, and Christina are here today as graduates, and what makes me even more proud is their dedication because they want to continue their involvement even after graduating. Most of us took the biggest risk of our lives, moving to a new country to study, with the hopes of settling down after. Some even left their high paying jobs to come here just because they dreamt of a better life. Canada does give us a better life (umm..Except the snow shoveling part maybe). It is a welcoming country, and so are its people. The sooner we realize this as immigrants, the sooner we can build stronger connections with the people here. Having this realization early on helped me immerse myself in the Canadian culture. I started attending various events and conferences in and around Toronto and was soon offered volunteer positions, which helped me build valuable relationships with people in senior positions at renowned Canadian organizations. People talk about getting lucky breaks in their careers. I’m living proof that the ‘lucky breaks’ theory is simply wrong. You get to make your own luck. The world is run by those who show up, not those who wait to be asked. It was through one of these relationships that I had fostered over several months that I got the co-op job I had desired. What was once a dream, became a reality. Now, I have many more aspirations and I am sure you do too. While it is good to have dreams and aspirations in life, remember that it is equally important to have the courage to pursue them. We have all set out on a journey of possibilities… and while you’re on this journey, you are going to be doing things and you are going to be scared. It’s natural. Everybody is. Even I am. But when this happens, and it’s going to happen more than once, do yourself a favor: go back to the days of your childhood, go to your favorite playground, take a deep breath and just say, “I’m stronger than I seem, I’m braver than I believe, and I’m smarter than I think.” And then, go do it. We are the graduates of the class of Fall 2017. Previous Networking – Are you Farming or Hunting? Next Where does your help come from? That’s great! Do you also have the opportunity to become a Valedictorian?